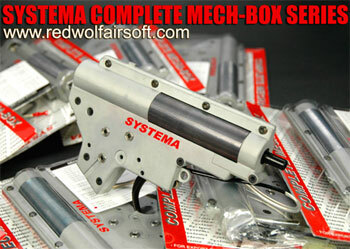 The complete line of Systema Fully-Assembled "Drop-In" mechboxes have arrived! RedWolf Airsoft currently offers the entire lineup. Built with the best parts and leading-edge engineering from Systema, these gearboxes are built for power and reliability. Beautiful teflon coated surfaces and high conductivity wires used for maximum performance! Installation of these ready-built gearboxes into AEGs should only be attempted by experienced personnel. Assembly and motor alignment requires skill and experience. Improper installation or misalignment of motor gear against first spud gear could destroy gearbox, so installation should only be handled by qualified experts only. Systema has confirmed that these are limited edition, and supply will be very much controlled. So if you are looking for a complete upgrade solution for your AEG, then act fast to grab yourself one of these! CLICK HERE to get one of these limited edition gearboxes!